I always make panner makhni,butter masala,shahi paneer regularly. Obviously,without a doubt, i got bored and so, for a change ,I tried this recipe which i happened to c from youtube. Ideas ,suggestions,tips, whatever u may call it, are always welcome in our world rt...When made this, i must say, it 's nothing but panner in a rich tomato gravy. My H doesn't like this @ all cos he s not a big fan of tomatoes. But i liked it good ,basically, it's just the same masala with an exception of onions.. Instead the author of this recipe has added dahlia and cashews to get the creamy consistency ,the ultimate curry. Hope u guys like it..
First fry the paneer cubes in a tbsp of butter for a minute or until it starts changing colour. Keep the paneer aside soaked in warm water. Now chop the tomatoes and toss into the blender/mixie. Add green chillies, dahlia,cashews,ginger and garlic into the blender/mixie as well and blend it to a very fine paste. ( no need to add water) Now add the remaining tbsp of butter in the same pan and mealt it. Add the cumin seeds and do the seasoning. Now pour this paste and stir for a minute. Cover the karahi and cook it for 5 more minutes . Then add the garam masala, coriander powder and the turmeric powder ,salt and mix well. Cover and cook until the starts floating on the top. Add the soaked paneer cubes now and mix well. Crush the kasoori methi leaves and add that too. 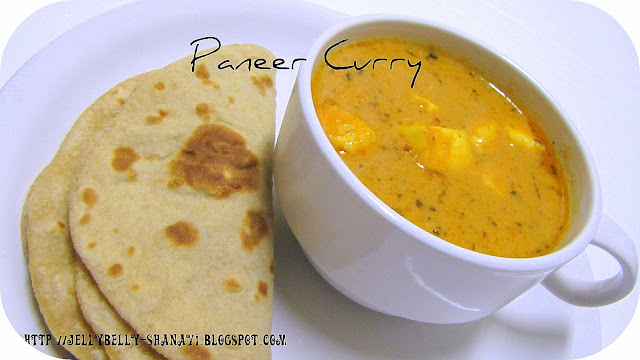 Mix well.Again close the karahi and cook for another 5 minutes Finally add the heavy cream and just give it a boil and then switch off..
Paneer curry is ready to serve now with roti's ,pulkas, naan etc..
Looks so tempting... Love the presentation..
Paneer one of my fav u r curry looks yummy and tasty. Rich and creamy,love paneer anytime,looks yummy. awesome and wonderful tasty paneer curry. Droolworthy and beautiful looking paneer curry..
looks awesome. Drooling over it. Paneer looks very nice... your presentation is absolutely wonderful... Great looking new looks.. keep rocking.